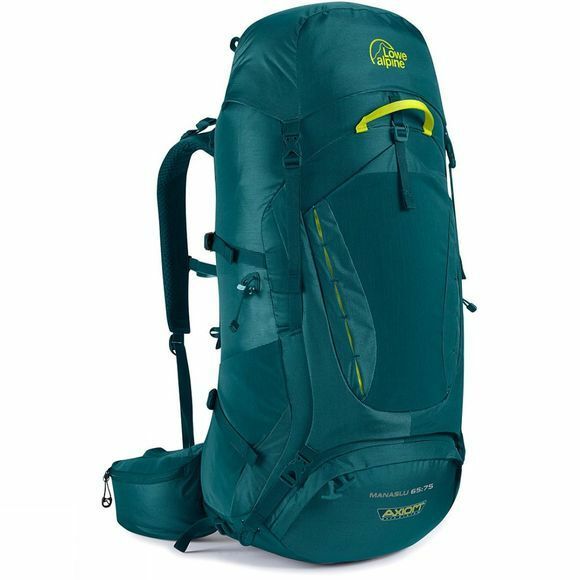 If you are going travelling or backpacking the Manaslu 65:75 Rucksack is the ideal companion due to its comprehensive feature set. The Axiom 5 back system is a real work horse, designed to do it all. From big mountain expeditions to year round travel, the three simple stage actions will keep you comfortable in challenging conditions. The pull release mechanism allows you to find the perfect back length quickly and efficiently. There are further strap pulls on the pack to distribute weight further across the hips, chest and back. Soft padding ensures a fully adjustable comfortable fit wherever your sense of adventure takes you. The front entry is accessible even if your poles are stowed, creating enough storage for larger items without having to open the pack. There are two large bellows side pockets for any small extras. Tuck away daisy chain lash points also feature on the outside of the pack allowing you to add extra kit, whether it be a bulky item such as a foam roll mat, or a series or carabiners. There is an integrated raincover to protect your kit from downpours, complete with a Velcro attachment ensuring it does not get lost in the wind, while a small hole at the base of the cover allows any water out that may seep in. To further secure the cover a handy clip has been added across the back to prevent the sides flapping in the wind. The pack is hydration compatible if you wish to add your own bladder system. There are two hipbelt pockets which allow you to keep your camera close to hand, or nibbles if you like to snack enroute. The lid rises to create the extra 10 litres of space for that extra kit you may pick-up along the way. This bag can accommodate walking poles as well as an ice axe making it an ideal multi-day companion for year round trips.